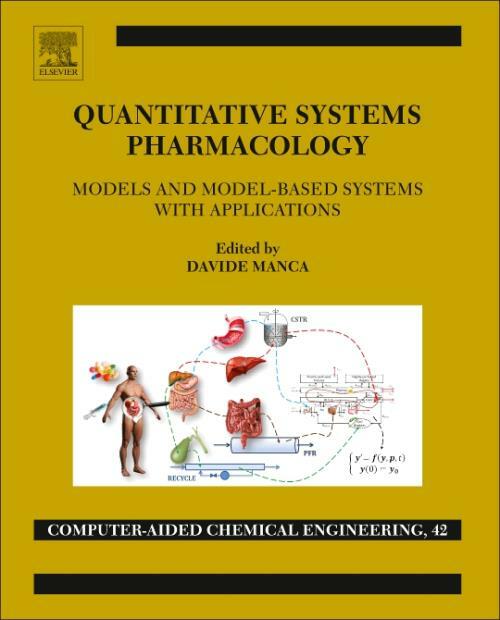 Quantitative Systems Pharmacology: Models and Model-Based Systems with Applications, Volume 42, provides a quantitative approach to problem-solving that is targeted to engineers. The book gathers the contributions of doctors, pharmacists, biologists, and chemists who give key information on the elements needed to model a complex machine like the human body. It presents information on diagnoses, administration and release of therapeutics, distribution metabolism and excretion of drugs, compartmental pharmacokinetics, physiologically-based pharmacokinetics, pharmacodynamics, identifiability of models, numerical methods for models identification, design of experiments, in vitro and in vivo models, and more. As the pharma community is progressively acknowledging that a quantitative and systematic approach to drug administration, release, pharmacokinetics and pharmacodynamics is highly recommended to understand the mechanisms and effects of drugs, this book is a timely resource. Davide Manca received the M.Sc. in 1990 and the PhD in 1994, both on "Chemical Engineering at Politecnico di Milano (POLIMI, Italy). He is professor of Process Systems Engineering and head of the PSE-Lab at POLIMI since 2002. He is (co)author of more than 210 peer-reviewed publications on international journals and conferences with a few book chapters. and industrial advice to make these worlds better interact and get benefit from their mutual collaboration. At the basis of Davide's research is the modeling activity that has the quantification of what is analyzed as the final target. Design, simulation, control, optimization, and assessment are the main features that use computer algorithms and methods to produce the quantification of phenomena, processes, and plants. Process Systems Engineering. He has been the supervisor of tens of students involved in the bachelor, master, and PhD degrees. He was founder and director of R&D and Engineering department at Virthualis, a spin- off company of POLIMI, working on operator training simulation in 3D immersive virtual environments. Under his direction, PSE Lab has worked on a number of European and Italian research projects with a fruitful collaboration with international universities and companies.